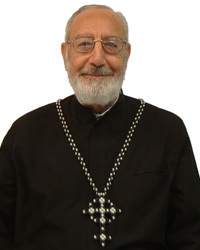 Archdeacon Michael Ishak was born in Egypt on September 1, 1931. He graduated from the College of Agriculture, Cairo University in 1952. He came to the United States in 1959 and received a Ph.D. in Oceanography and Fisheries from Seattle, WA in 1964. Archdeacon Ishak returned to Egypt and worked at the National Center for Research in Water Pollution and was an Associate Professor at the same institute. He returned to the United States in 1986 and worked in research at UCLA and USC for 14 years. He was ordained an Archdeacon by His Grace Bishop Serapion on December 17, 2001 to serve at St. Peter and St. Paul Church in Santa Monica.